Calzadilla de la Hermanillos to Puente de Villarente 32 km. A day out on the big empty. The first 25 km were through slightly rolling fields broken by a few canal crossings, but really just path and sky. 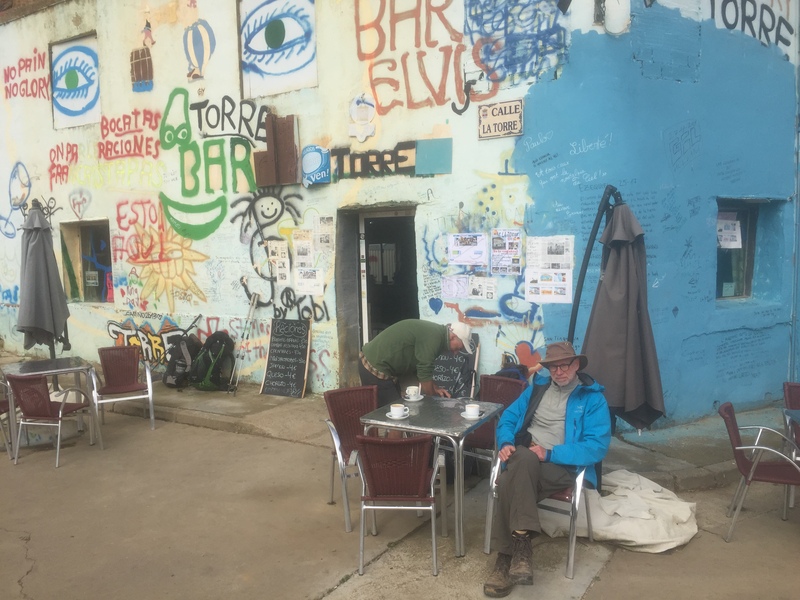 It ended finally on arrival in Reliegos and the Torres bar which was covered with hippie graffiti, blasting blues, and made the best coffee so far, a high point in an otherwise blank day. It was, and has been, all about the walking and not about seeing. Unlike the Appalachian trail green tunnel, this is a green plain, but the effect is the same. Walking, you turn inward, only opening out when a bird, or wind, or stand of trees intrudes. Beautiful Albergue tonight with only a few pilgrims, but some of my favorites.